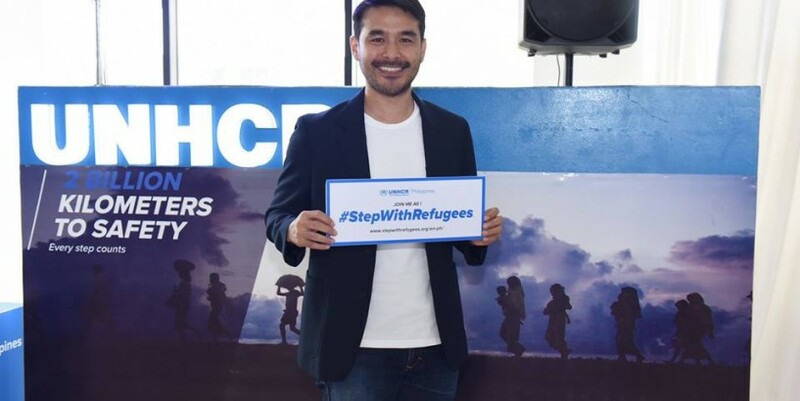 Broadcast journalist and the newest global Goodwill Ambassador of the United Nations High Commissioner for Refugees (UNHCR) Atom Araullo called on Filipinos to take a step in helping and empowering refugees across the globe. “We can never move forward by leaving the most vulnerable behind,” Araullo said. He added that lending a hand to refugees all over the world is more than an act of charity or sympathy. “It is our collective desire to be able to move forward as a society. Their (refugees) problems are also our problems,” said Araullo. “Empowering refugees by helping them rebuild their lives means recognizing that they are not threats, they are people who, when empowered, can be some of society’s greatest contributors,” Araullo stated. According to UNHCR, the number of refugees has reached a record-high of 68.5 million, and about 87, 505 of the displaced persons are in Mindanao. In his speech, Araullo mentioned that there is a greater need of support and care for refugees, especially now when one person is displaced every two seconds. “There are so many displaced people around the world. It’s growing each and every year not just because of war, conflict, or persecution; it’s also because of problems like climate change. People living in areas where there wasn’t any problem before are now being forced to move just because they’re looking for a better place to raise their families, to get away from the stress of finding something to sustain their everyday needs,” said Araullo. Araullo also shared that talking to refugees across the globe has made him realize that anybody could experience being displaced, which made him even more eager to spread the word about refugees and how big of a concern it is globally. “At any given day this (what refugees went through) could happen to us, and we want to make sure that we are working together so that we can help each other at our time of need. Sometimes it’s difficult to imagine especially if you’re not really living in a place that you can assume, will be under threat or under siege anytime soon but it’s based on my experience talking to all these refugees. It can happen to anyone,” he told The Manila Bulletin. “We have to show that we have this compassion for other people because at the end of the day, it’s just one goal, we all live in one global village and if today a certain set of people is in need, the following day we might find ourselves in their situation so we should be able to help each other,” Araullo added. The Philippines has long been a “source of outpouring generosity for families on the run from persecution and death,” according to Shinji Kubo, UNHCR representative to the Philippines. “We Filipinos are not strangers to demonstrating profound generosity and compassion to families on the run,” Araullo said, adding that for the past centuries, the country has welcomed Russians, European Jews, and Vietnamese refugees. The Philippines has also made efforts in showing its solidarity with displaced and stateless people; among these efforts are the country’s signing of the landmark global compact on refugees last year and the adoption of refugee initiatives of four Philippine cities, namely: Vigan, Ilocos Sur; San Fernando, La Union; and Sta. Maria, and San Jose de Monte, Bulacan. This year, Filipinos are enjoined to take part in UNHCR’s global, solidarity campaign for refugees called “2 Billion Kilometers to Safety: #StepWithRefugees” – a virtual walk or run where participants across the globe are challenged to cover two billion kilometers, the same distance which refugees walked each year to reach their first point of safety. Araullo said taking part in campaigns such as “2 Billion Kilometers to Safety” empowers and strengthens the global community’s response to issues such as displacement. “No matter how big our global problems are, our actions as individuals are not just a drop in the bucket,” he said. “We can start with a simple step in solidarity with the world’s refugees and let’s make this step count,” he added. To know more about the “2 Billion Kilometers to Safety” campaign, visit www.stepwithrefugees,org/en- ph/ .